Welshman Sam Vokes scored on his 100th Premier League appearance as the Clarets secured their first ever win at the Cardiff City Stadium. Burnley last beat the Bluebirds on their own patch 18 years ago when Steve Davis and Andy Payton netted in a 2-1 win at Ninian Park. They'd only won twice in 20 attempts away at Cardiff and eight times in total from 42 fixtures but they put that record behind them to seal three vital points. For those switching over from the Ryder Cup, having experienced the exhilarating highs as Europe triumphed over the United States, they would soon be reminded that sport isn't always gripping. The first half at the Cardiff City Stadium didn't exactly live up to its billing on Sky Sports. A 'Super Sunday' it certainly wasn't. Burnley managed just one shot on goal in 45 minutes but Matej Vydra's attempt was more suited to the national sport of Wales. Even then, however, the forward's attempt would have been wide of the upright. Callum Paterson's attempt for the Bluebirds wasn't much better, either. The 23-year-old dragged the ball wide of the target after Joe Ralls had collected Ben Mee's clearance. As the Clarets struggled to get a foothold in the game, Neil Warnock's side continued to press and Joe Hart had his woodwork to thank after Josh Murphy broke in to the box from the left hand side. 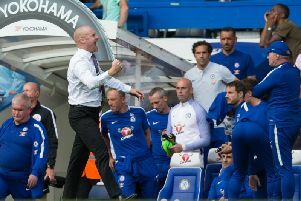 Burnley boss Sean Dyche was forced in to a change midway through the first half as James Tarkowski, struggling with a shoulder injury, was replaced by Kevin Long. Hart has been in fine form since joining the Clarets in the summer and the England international had to be at his best to deny Victor Camarasa at his near post after the Spaniard latched on to Paterson's pass. The home side had the ball in the back of the net with 10 minutes of the half remaining but referee Martin Atkinson pulled play back after spotting an infringement. City skipper Sean Morrison was the guilty party, climbing on the back of Long from Camarasa's corner as Zohore flicked the ball past Hart. The Bluebirds almost had their noses in front just before the break when Vokes inadvertently glanced Morrison's header in to the six yard box and Paterson's looping header was cleared off the line by Vydra. City appealed desperately for a penalty in time added on as Paterson acrobatically fired in to the arms of Matt Lowton but the cries fell on deaf ears. Viewers would have been forgiven for switching off to catch the celebrations in Paris but they would have missed Johann Berg Gudmundsson's opener. Quick thinking from Aaron Lennon caught the hosts by surprise and Ashley Westwood's cross was converted at the far post by the Icelandic winger, who had to check twice to make sure that his header had beat Neil Etheridge. Camarasa fired over on the volley as Cardiff responded and they levelled on the hour as Burnley left their dangerman unmarked. Bruno Ecuele Manga was allowed to get in behind on the right and his cross was fired back in the direction it came from by Murphy who picked out the corner. The equaliser lifted the home side and it was Murphy who continued to threaten. The winger was denied by a fine save at full stretch from Hart and then Long took the sting out of his left-footed drive which the goalkeeper collected at his near post. Burnley had been struggling to find their rhythm but they played all the right notes with 20 minutes remaining as they restored the lead. Jack Cork and Westwood kept the ball in midfield before the latter caught Sol Bamba flat-footed, lifting the ball over the top to Gudmundsson. The goalscorer then turned provider, teeing up Vokes who headed in to the far corner to make it 2-1. The hosts pressed for another equaliser but Camarasa and Murphy were both off target as the Clarets held on to record a second win in succession.